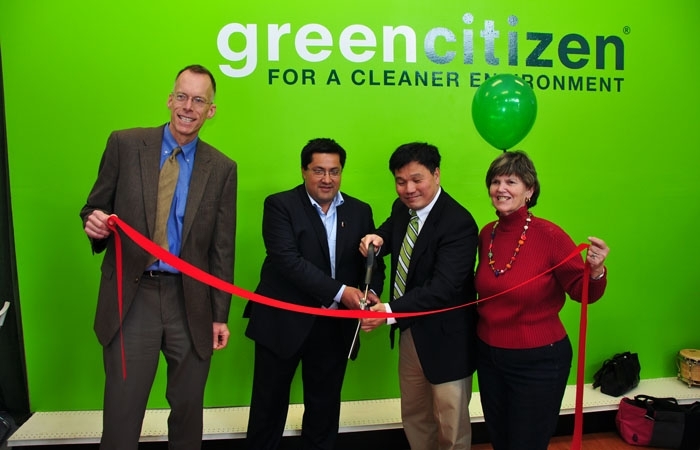 Green Citizen celebrates its opening in Berkeley and its sixth anniversary on Earth Day. James Kao is ready to restore or recycle old electronics at his new GreenCitizen center in Downtown Berkeley, where family, friends and community members celebrated the store's opening and the business' sixth anniversary with a ribbon-cutting ceremony Friday. The store, located at 1971 Shattuck Ave., is the fourth that Kao, the chain's founder and CEO, has opened in the Bay Area. Kao established the first location in Palo Alto as a center for one-stop recycling and disposal of electronic waste after three years of researching e-material disposal methods in the United States. "We started with a kiosk," said Kao's wife, Mavis Kao. "People could come and drop off their items. We would pull the sign off the top and put the whole thing in the trunk of our car." Consumers can either extend the life of electronics through repairs or erase the hard drives on site, a method that lowers the risk of identity theft - a problem Kao identified for American companies that ship overseas - and reduces environmental footprint. he believes his training will help him analyze new recycling methods. "Berkeley students will influence the future," Mavis Kao said. "One day when the interns are manufacturers or work in government, they will know what the problems are and make a better product."